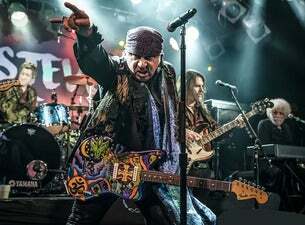 Little Steven – real name Stevie Van Zandt – is a musician, performer, songwriter, arranger, producer, actor, director and composer. He was inducted into the Rock'n'Roll Hall of Fame in 2014, he is widely recognised as one of the world’s foremost authorities on both contemporary and traditional Rock'n'Roll. A founding member of Bruce Springsteen’s E Street Band, he has gone on to become a successful solo artist in his own right, recording and performing solo with his band Little Steven and the Disciples of Soul. The Disciples of Soul comprises of Stevie Van Zandt (Guitar, Vocals), Marc Ribler (Guitar, Slide Guitar), Rich Mercurio (Drums), Jack Daley (Bass), Andy Burton (B3 Organ, Accordion, Synthesizers), Lowell “Banana” Levinger (Piano, Mandolin, Esra), Eddie Manion (Horns, Baritone Sax), Stan Harrison (Tenor Sax, Alto Sax, Flute, Oboe), Clark Gayton (Trombone), Ravi Best (Trumpet), Ron Tooley (Trumpet), Anthony Almonte (Percussion), Jessica Wagner (Backing Vocals), Sara Devine (Backing Vocals) and Tania Jones (Backing Vocals). Little Steven & The Disciples of Soul 2019 UK tour kicks off in May and they'll be returning again for three more dates in August.